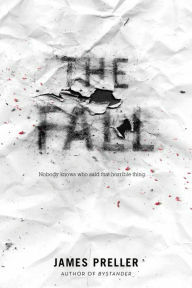 The Fall by James Preller is a 208 page novel for grades 6 and up about bullying and cyber bullying. Written as the journal of high schooler Sam Proctor, The Fall describes the suicide and aftermath of student Morgan Mallen. Morgan had been the target of the most beautiful/popular girl in the school who rallied the other students to bully her on social media. And then Morgan commits suicide by jumping off the town’s water tower. Sam had been her sort-of friend and feels guilty that he participated in the bullying although he liked Morgan. Through the journal, Sam explains how he got to know Morgan and the level of their friendship as well as his fear of others finding out he was friends with her. As Sam fills in the background, we learn more about how isolated Morgan’s life was and what possibly led to her despair to commit suicide. A quick and timely read. This entry was posted on May 15, 2016 at 2:19 pm and is filed under Adult Readers Advisory, Teen Readers Advisory. You can follow any responses to this entry through the RSS 2.0 feed. You can leave a response, or trackback from your own site.